I saw this flower on Pinterest yesterday and fell in love. Either that or I’m just so sick of making owl hats that I jumped at the opportunity to use my hands to create something different. Regardless, I’m pleased with how this flower crochet pattern came out. I’m not sure it fits into the categories of rosette or daisy… maybe a chrysanthemum (you will not believe this… I spelled that right the first time!)? Anyways, I’m still trying to put off making owl hats for just a few more minutes so I decided to post about it and let you know exactly how I made mine. 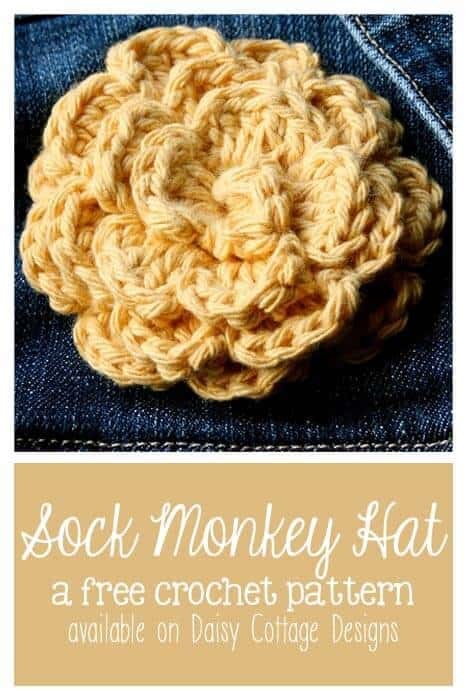 The basic pattern for this flower came from the Crochet Geek website. The linked post even includes a video tutorial. I wanted a bigger flower and knew the shape of petal I wanted, so here’s what I went with. Row 2: *Ch 2, 5 DC, ch 2, sl st* in the first chain loop and in each chain loop until you reach the end. Leave a long tail. You should have been creating a long spiral of petals. Once you’re finished, arrange your spiral into a flower and secure with the tail. After you secure the back, attach a pin or an alligator clip and add a pop of color to your winter wardrobe! Do u slipstitch in thee loops on row 2? I tried it the way u posted and it just wasnt working for me.. Yes, Summer, you do! I&#39;ll go back and add that right now! Thanks for replying Lauren! And hey we have the same last name! On this flower are we turning on row 2 or going on the other side. Thanks for sharing so many cute patterns! I love your blog!